The right tool can help save time and increase efficiency on the job site. See how using the right labeling tool enabled a large national rail carrier to streamline and automate the process of tracking, managing and labeling security assets. When a large national rail carrier set out to apply unique identification (UID) codes to all security cameras across its network of train stations and terminals, they established an implementation plan and multi-year timeline. In the current business scenario, asset management of a coast-to-coast network of security cameras was centralized at the company’s east coast headquarters, while the actual asset tagging and labeling was performed at literally hundreds of disparate locations. The company’s passenger trains traverse more than 20,000 miles of railway-hosted track across the U.S. and Canada and serve hundreds of destinations. Tracking, managing and labeling these security assets is a monumental task, and streamlining the process was the company’s priority. As of this writing, the company has researched, compared, and is in the process of deploying a smart, fast and efficient QR code labeling solution across its national network of train stations and terminals. I met with the rail carrier at a security and AV tradeshow where the project manager outlined the company’s desire for a more streamlined solution. After taking time to understand the unique, and very real challenges they faced in tracking and updating an expansive network of installed security cameras – it was clear they needed a more scalable, accurate and efficient asset management solution. It should be noted that the system would continue to be managed by one person in a central location. Their biggest challenge was that each security camera in had a unique identifier and its own set of data points. Under the current system, bar coded numbers corresponding to a centralized Excel spreadsheet were being entered manually out in the field – and then three to four bar code labels generated for each camera. At best, this process was prone to human error, cumbersome to maintain and expensive. At worst, it was risky. Our goal was to define a simple, affordable asset tracking system that would be as reliable as the security system to which the cameras were attached. We were confident that the Brother Wi-Fi-enabled industrial label printing solution: the P-touch EDGE PT-E550W could automate and help dramatically improve the process. In transitioning to a more automated system, management’s first step was to integrate the data points in the Excel spreadsheets – which could then be converted into a single QR code. QR codes can store more information than horizontal bar codes and can be scanned easily from a smartphone. Once accomplished, the project flowed quickly. The central office would email the spreadsheet, complete with the embedded codes, to the desired location via Brother’s Transfer Express app. Using the app, the labeling contractor then downloaded the database file into the PT-E550W label printer, which is now ready to generate the QR coded labels. The risk of inaccuracies due to human error is dramatically minimized. The rail company reports that the new Excel database file has become a living document used to manage all of their cameras nationwide. If a change needs to be made to a QR code, it is made in the spreadsheet with the help of Brother’s acclaimed P-touch Editor software – included free with the PT-E550W label printers. The change is emailed to the location’s receiver, who downloads the data directly to the PT-E550W label printer – right in the field – to generate a new updated QR code label. Overall, using the new solution, the carrier says they are printing fewer labels with less waste and are now better able to manage the whole system with the confidence that the UID labels are accurate and up-to-date. The rail giant has eight to ten different camera models in use around its transportation network and three different QR code label designs are used. Brother engineers assisted in standardizing the stored label templates to make it fast and easy for workers in the field to choose the right one for that location. 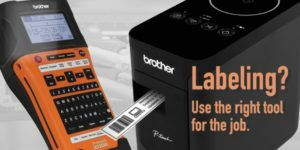 The Brother PT-E550W labeling tool with Wi-Fi connectivity provides wireless data transfer and on-demand bar code and QR code label printing directly from smart devices in the field, including Windows®, iOS®, Mac® and Android™ smartphones, tablets and PCs. As the most powerful member of Brother’s EDGE family of rugged industrial handheld printers, the PT-E550W allows users to download and store custom label files and databases and to print full project or individual labels wirelessly right at the jobsite. Superior label and print quality are essential for any installation, but especially critical in harsh environments, such as those along rail lines, in stations and terminals where security cameras are typically mounted. Brother’s clear, precise print quality and fully laminated labels are up to the job. They are tough, long-lasting and able to stand up to rough handling, weather conditions, abrasion and contaminants, such as dust and air pollutants. The rugged, easy-to-use PT-E550W labeler was engineered as a powerful alternative to sheet label systems and ideal tool of choice for large infrastructure installations. With build-in templates, files and databases instantly available, work crews can save time, improve accuracy and minimize keystrokes in generating labels for essential equipment and components, whether indoors or out. To date, over 150 of the PT-E550W mobile labeling tools have been purchased and deployed to contractors in major cities such as Philadelphia, Chicago, Atlanta, Houston, and Dallas. Hundreds more are expected to deploy as the project progresses towards planned completion at the end of 2019. To date, automation and smart mobile technology have helped dramatically streamline the process and reduce human error in the field. The rail carrier reports that they and their installation partners appreciate the benefits provided by a simpler, more automated equipment labeling system. Among the conveniences cited are the printer’s ruggedness, ease of use, Wi-Fi connectivity, and superior quality of laminated labels.